Week Four of the 2014 NFL season kicks off with the Eli Manning and the New York Giants meeting Robert Griffin III and the Washington Redskins on “Thursday Night Football”. 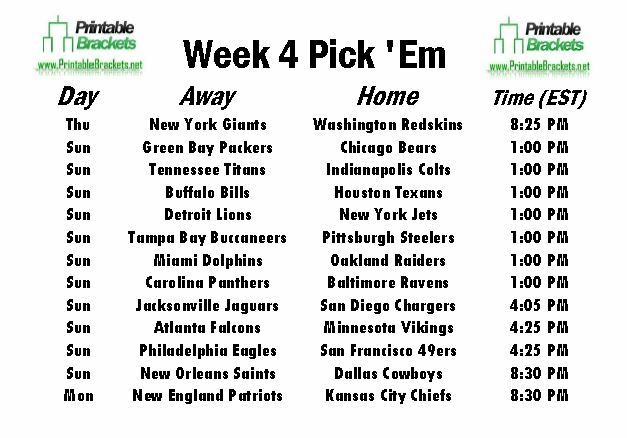 Running an office pool is a breeze with a printable NFL Pick Em Week 4 sheet. The sheet can be downloaded instantly for free compliments of Printablebrackets.net. Traditional NFC East rivals kick off the action on the NFL pick em Week 4 sheet as the Giants hook up with the Redskins at FedEx Field. Each team enters the 2014 campaign looking to get back in the playoff hunt after disappointing 2013 seasons. The Giants never completely recovered from an 0-6 start and finished third in the NFC East with a record of 7-9. Washington was at the bottom of the division after going a woeful 3-13. The dreadful season led to the removal of head coach Mike Shanahan. There are seven early games on the NFL pick em Week 4 sheet. The early action is headlined by a meeting between the longest-running rivalry in the history of the NFL, as Jay Cutler and the Chicago Bears will host Aaron Rodgers and the Green Bay Packers. Also early Sunday, the Baltimore Ravens will battle the Carolina Panthers. Ravens wide receiver Steve Smith will face the Panthers for the first time since being released by Carolina during the offseason. In late action on the NFL pick em Week 4 sheet, the San Francisco 49ers will welcome the Philadelphia Eagles to the new Levi’s Stadium. On “Sunday Night Football”, Tony Romo and the Dallas Cowboys will take on Drew Brees and the New Orleans Saints in Arlington. The final game on the NFL pick em Week 4 sheet features the Kansas City Chiefs hosting Tom Brady and the New England Patriots on “Monday Night Football”.